In the blur of family and glittery lights and presents to open, Christmas morning breakfast sometimes gets overlooked – but it never did for me. Sure, presents were top priority, like any kid, but I also really, really looked forward to breakfast. Every year, my grandmother would bring a loaf of German sweet bread (not sweetbread!) called Stollen (Pronounced like stolen, but with a “shhhh” sound at the beginning) with her from New York and I would cut one thick slice after another, slather it with butter, and shove it down my gullet, usually leaving behind the bottom half, since it didn’t come with the bite of a thick layer of sugar that sat on top of the loaf. Seriously, it was a half-inch-tall sugar hat perched on top of the loaf. It was amazing. Christmas was the one day of the year that I got to eat sweets for breakfast, and I’ll be damned if I didn’t take advantage of it. Now that I am an adult, I disappointingly don’t have any real desire to eat sweets for breakfast, except for these scones, which are just sweet enough but nowhere near being covered with half an inch of sugar. Thank goodness for that because oh my gosh the sugar crash that those slices of stollen resulted in…But I digress. 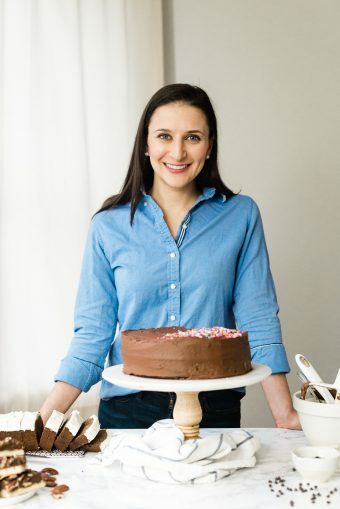 You know this is a sugar crash free zone, not only because of the lack of sugar shellacking on our Christmas breakfasts, but also because of the hearty, low carb/high (healthy) fat nut flour base of most of the baked goods on this site. Unlike the other recipes here, which use blanched almond flour, I went a slightly different direction with these scones. The base is made from Pamela’s new Grain Free Nut Flour Blend. I’ve never used walnut or pecan flours in any of my baking, but I was pleasantly surprised by the rich, nutty (go figure!) flavor that they lent to the finished product, which complemented the bright, spicy ginger flavor perfectly. I love this stuff. 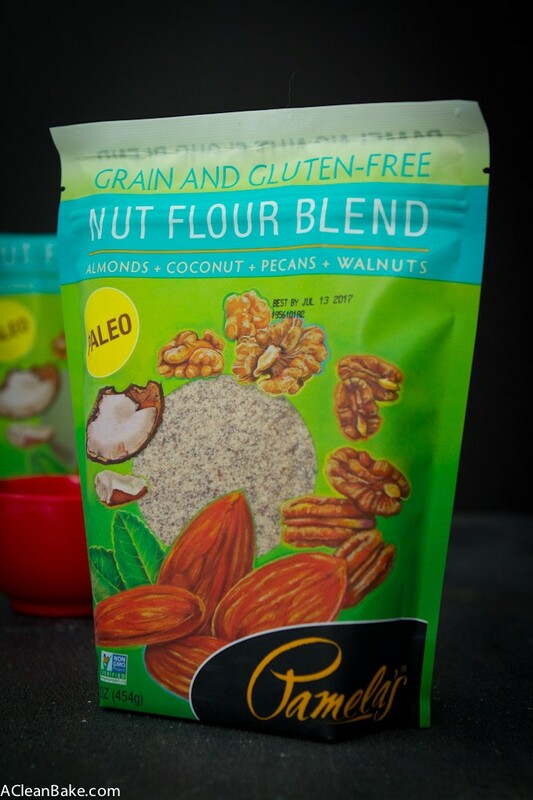 I’ll never stop using blanched almond flour, but if you want a slightly more complex, heartier and nuttier base for your baked good, this flour is wonderful (please note that it is not a perfect 1:1 substitution for almond flour, though. At least not in the recipes you’ll find here). And, like almond flour, it lends itself to the bowl-and-spoon, no-mixer-necessary, ready-in-under-an-hour method of baking that I know we time-pressed bakers love, especially around the holidays. Which brings us back to Christmas morning. Whether or not you celebrate the holiday, consider it an excuse to make a slightly special (but not so special it takes hours and stresses you out more than you already are this time of year) breakfast for your family, your friends, or – the best reason – just yourself. You deserve it! PS: Just a friendly reminder that this post was pre-scheduled, since I am currently on maternity leave. If you have any questions or comments about this recipe, feel free to leave me a note below or email me (acleanbake@gmail.com) and I will get back to you as soon as I can – but probably not as quickly as usual. Thanks for understanding! 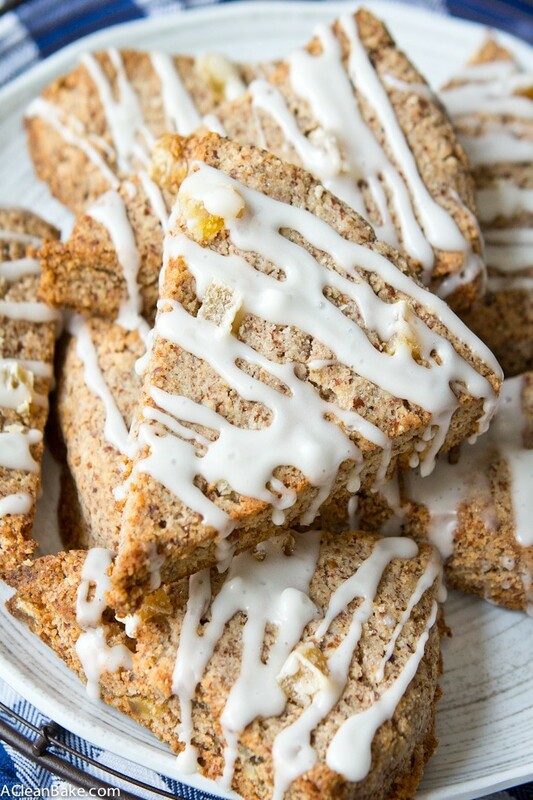 Paleo ginger scones are the perfect special occasion breakfast since they look and taste fancy but take almost no time at all to make! Preheat the oven to 350F. Cover a large baking sheet with parchment or a nonstick pad and set aside. Top a large cutting board with a piece of wax paper and set aside. In a large mixing bowl, whisk together the nut flour blend, tapioca flour, stevia, baking powder and salt and set aside. In a small bowl, whisk together the slightly cooled butter or oil, the egg and the coconut milk. Add the wet (egg/butter or oil/coconut milk) ingredient mixture to the dry (flours) mixture and mix until just combined. Fold in the chopped ginger, then gather the dough into a ball and transfer to the wax paper-covered cutting board. Top with another piece of wax paper and roll (or press, using the heel of your hand) into a disc about 1" tall and 7-8" wide. Use your fingertips to smooth the edges by pinching together any cracks on the edges of the disc. Using a sharp knife to cut the disk in half, then cut each half into 3 triangles. 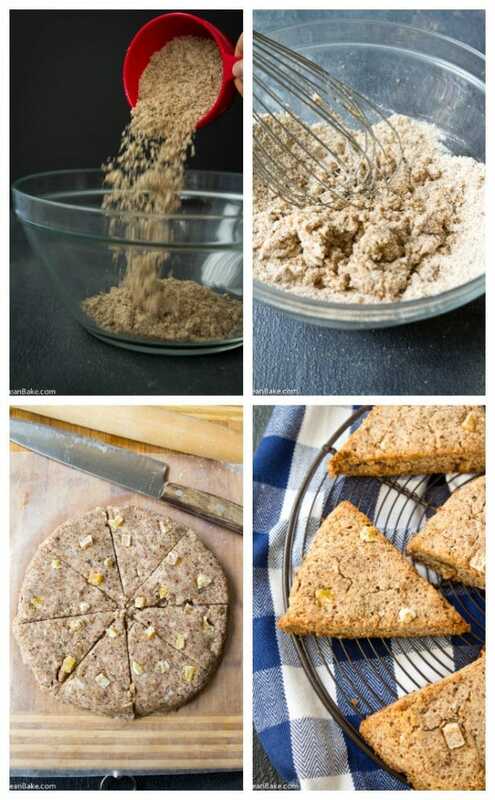 Transfer each scone to the prepared baking sheet and press a few more pieces of chopped ginger into the tops of each. Bake for about 20 minutes until the edges are golden. Remove the pan from the oven but leave the scones on the pan; they will firm up as they cool. When the scones are completely cooled, whisk together the powdered sugar and milk to make the glaze. 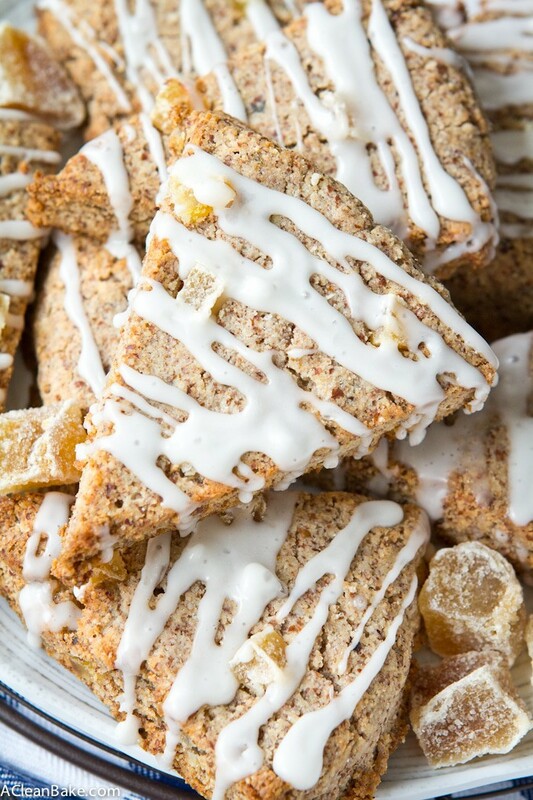 Use a tablespoon or pastry bag to drizzle the glaze over the scones and immediately put the tray in the fridge so that the glaze firms up before it slides off the scones! 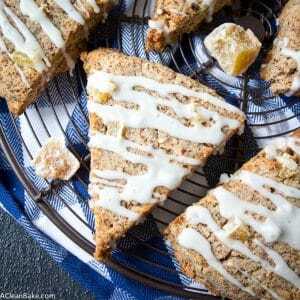 You can use candied or uncandied ginger. If you use uncandied, or do not plan to glaze your scones, you may want to add another Tablespoon or two of granulated stevia to the dough. You can taste and decide. After you fold in the ginger, the batter might look crumbly but should hold together when you press it into a ball. If you're not going to serve these immediately, you can store them in an airtight container at room temperature for up to 3 days, or in the freezer for up to 3 months. Yield: 6 scones. You could also divide the batter into two discs if you'd like to make 12 mini scones instead. These look amazing! 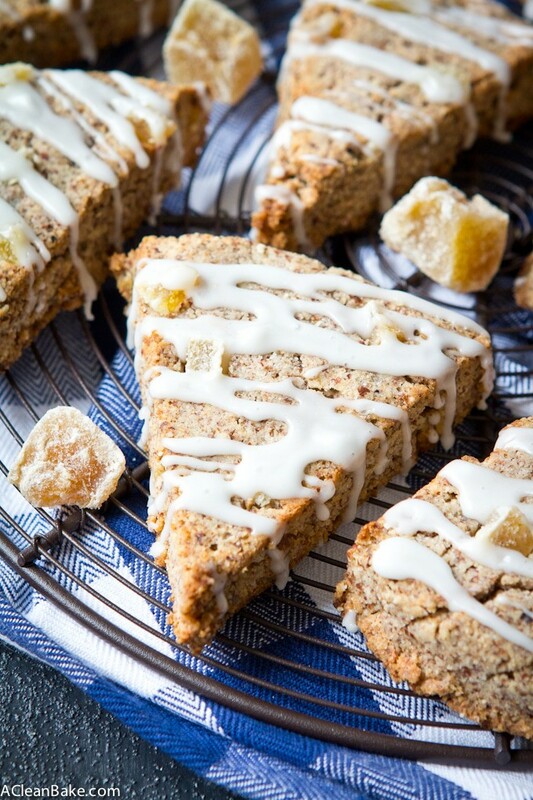 I adore ginger and would love to have a couple of these scones for breakfast. 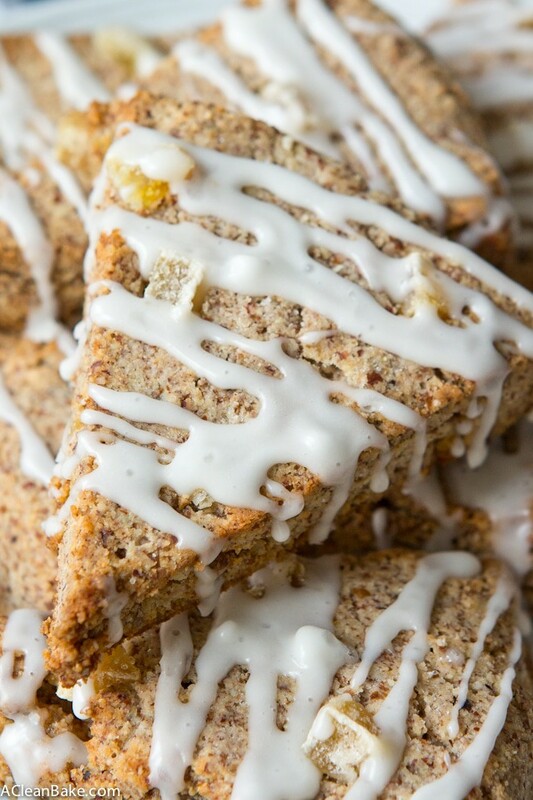 If you love ginger then these are perfect for you! These scones looks amazing! I’d love to dunk them in coffee for a wintery breakfast treat without the sugar high!